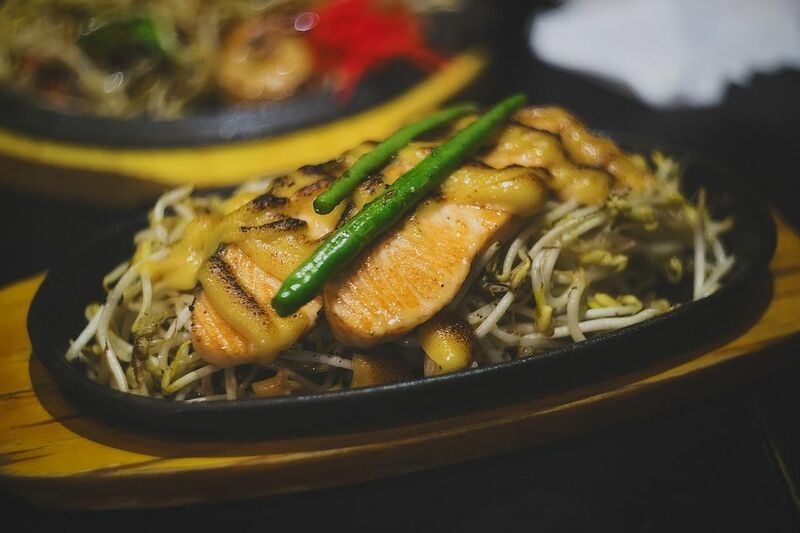 This is a simple Japanese recipe for seared salmon with a sauce made from rice vinegar, mirin (sweet cooking sake wine), soy sauce and a little sesame oil, topped with fresh green onions and served with steamed rice. I use sockeye salmon for this because it is firm and full-flavored, but you could use king salmon, silver salmon or farmed salmon if you'd like. The dish comes together quickly and is a great quick and easy, low-fat meal. This recipe serves 4 as a main course. Take the salmon out of the fridge and sprinkle it generously with kosher salt. Set aside for 10 minutes. Meanwhile, heat a large pan over high heat for 1-2 minutes, then add the oil and let it heat up until almost smoking. It is important that your pan is hot. Once you see the first wisps of smoke, turn the heat down to medium-high. Pat the salmon fillets dry and sear them in the pan. Do not crowd them, and let them sizzle for a good 2-4 minutes, depending on thickness. If they are sockeye or silver salmon fillets, you will need about 3 minutes per side. Turn the salmon over and cook for 1-3 minutes on the other side. A typical sockeye fillet will take only about 90 seconds on the second side. Remove the salmon to a warm plate, then take the pan off the heat. Add the soy sauce, mirin and vinegar and start scraping off with a wooden spoon any bits stuck on the bottom of the pan. Return the pan to the heat and bring to a rapid boil. After a minute or so, turn off the heat and add the green onions. Swirl around to coat, then pour over the salmon fillets -- serve with the crispier side of the fish facing up. Eat this with pickles and steamed rice. A simple tomato or green bean salad would also be good. As for a drink, I'd recommend a lager beer or a rounded white wine such as a California Chardonnay, a Roussane or an off-dry Riesling or Gewurztraminer.